One of my favourite summer activities is to hunt down this artisan ice pop maker in Vancouver who rides his bike around city with his ice pops and makes occasional pit stops at the farmer’s markets. My first ice pop from his ice pop bike was a creamy avocado and lime ice pop. It was the most life changing an ice pop could be. After that initial ice pop (aka the gateway ice pop), I would always get two ice pops when I see his bike. Avocado lime will always be my go-to but there was one time when I decided to try something new. The cherry cheesecake pop intrigued me because I loooooove cheesecake. I am low key obsessed with the frozen cheesecakes you buy from the grocery store. I eat them frozen because I do not have an affinity towards soft cheesecakes. The ice pop was everything. 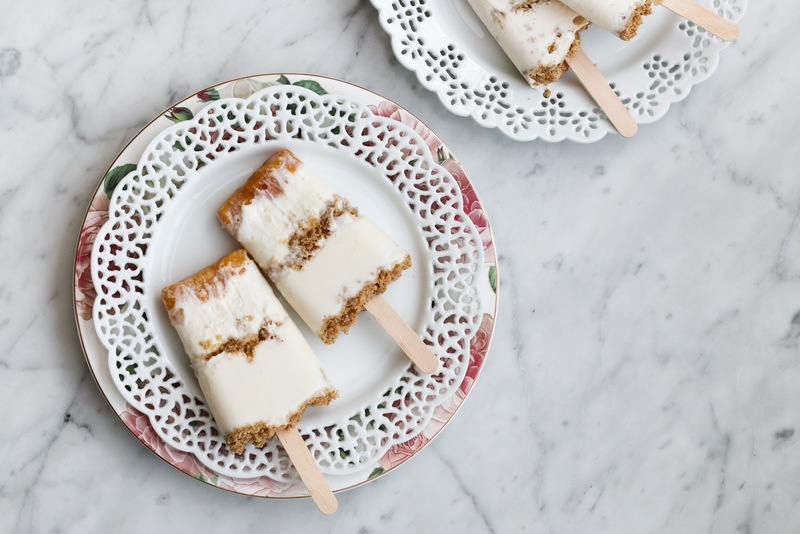 It was a complete upgrade of your usual frozen cheesecake on a stick (which does exist!) and it was studded with pitted cherries throughout. What I am ultimately trying to say is that I am glad I decided to try something new (for a change) and buy the cheesecake pop. 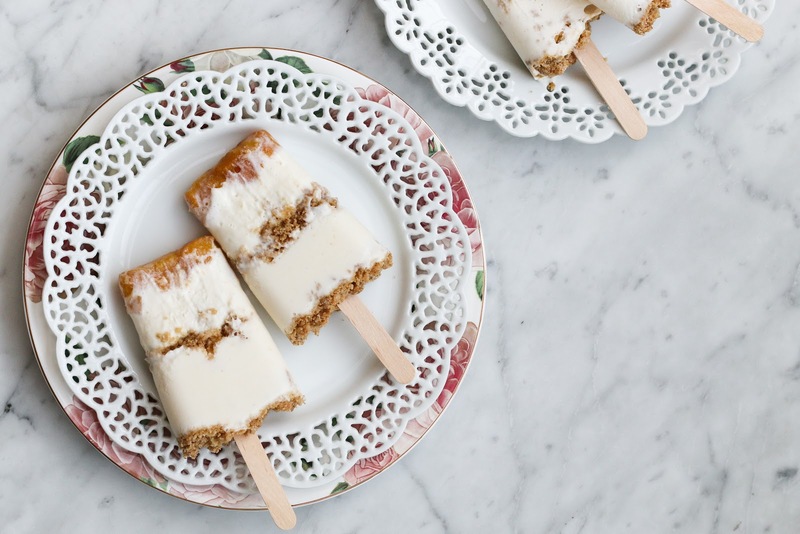 Without that initial cheesecake pop, this cheesecake pop might not have existed. I did not go the pitted cherry route because the process of pitting cherries is blah and peaches are finally in season! 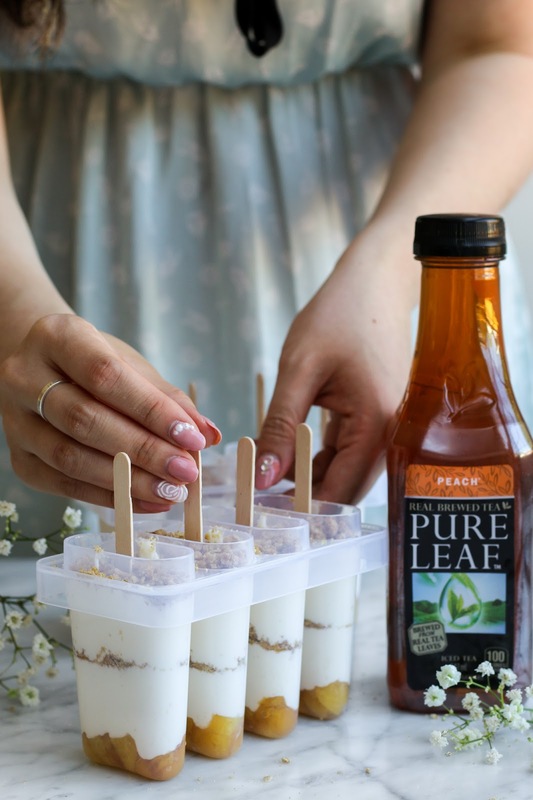 I poached the peaches in Pure Leaf Peach Iced Tea (Happy National Iced Tea Day, actually!) 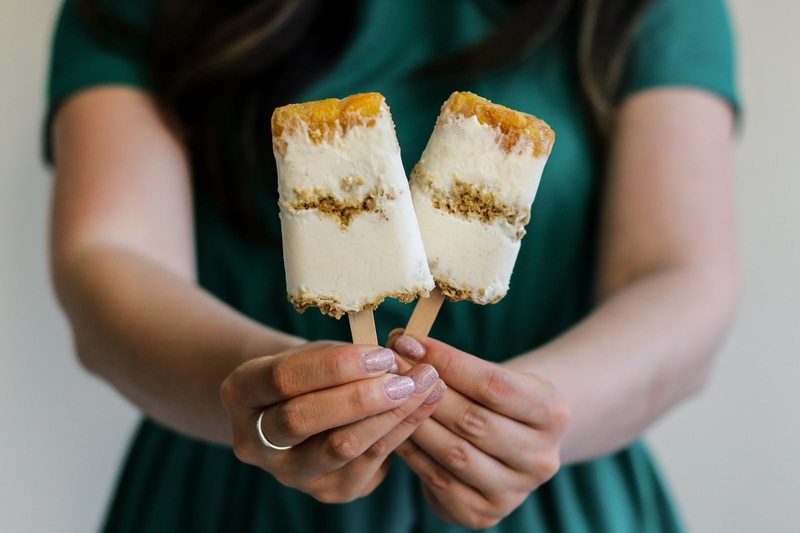 to get a stronger peach flavour, layered that with a creamy cheesecake base, and finished it off with an addictive cinnamon oat streusel. 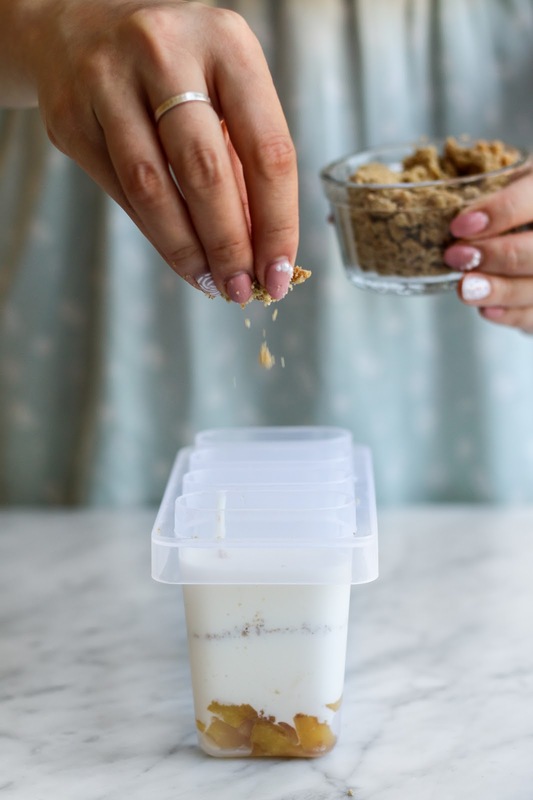 The oat streusel is a play of the classic graham crust but with more texture…because #texture. Until I find the ice pop guy on his bike, I will be munching (because I like biting into my frozen treats) on these ice pops. 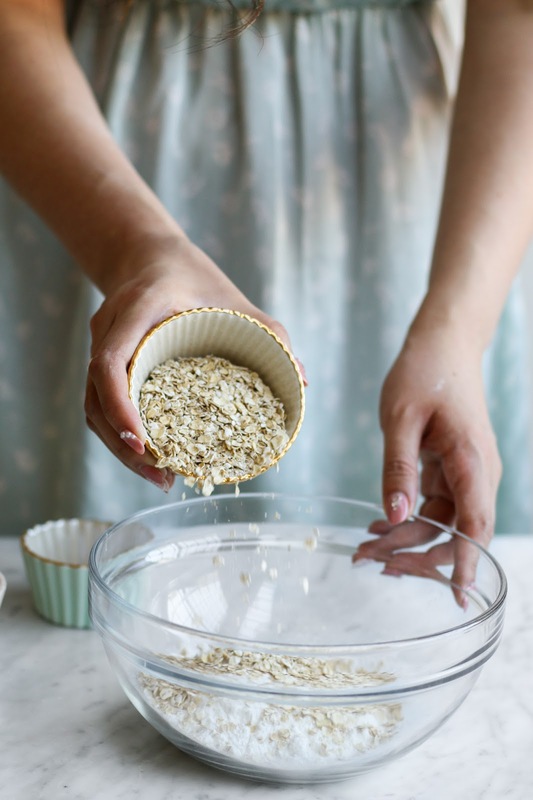 In a medium sized bowl, whisk together flour, oats, brown sugar, cinnamon, and salt. 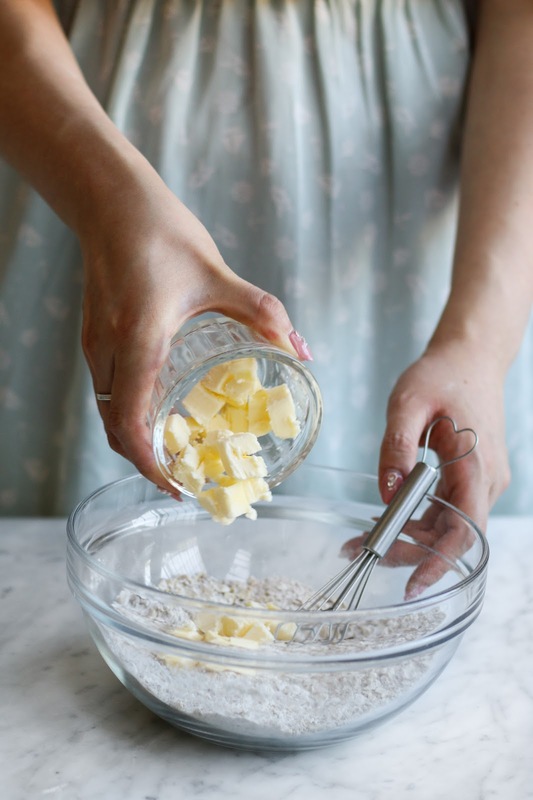 Using a fork or pastry cutter, incorporate the butter into the flour mixture. Streusel should be in pea-sized crumbs. Prepare a baking sheet and spread streusel into one layer. Bake streusel for 20 minutes. Remove baking sheet from oven. 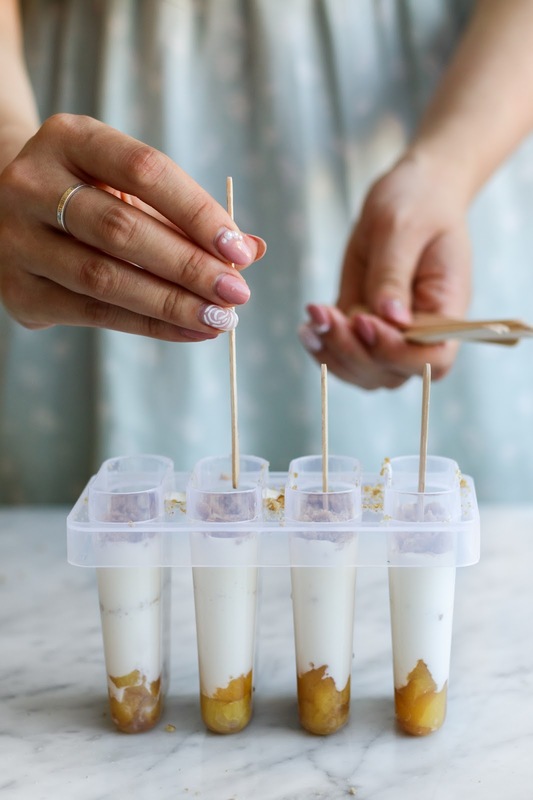 Let streusel cool before assembling ice pops. Prepare three small peaches by peeling and pitting them. Cut them into halves. Place prepared peaches and Pure Leaf Peach Iced Tea into a medium sized saucepan. Over low-medium heat, cook peaches in Pure Leaf Peach Iced Tea until they are tender, roughly 15 minutes. Strain peaches and let them cool. Dice the peach halves into ¼ inch cubes. In a blender, combine cream cheese and confectioners’ sugar. While blender is still running, gradually pour in milk. 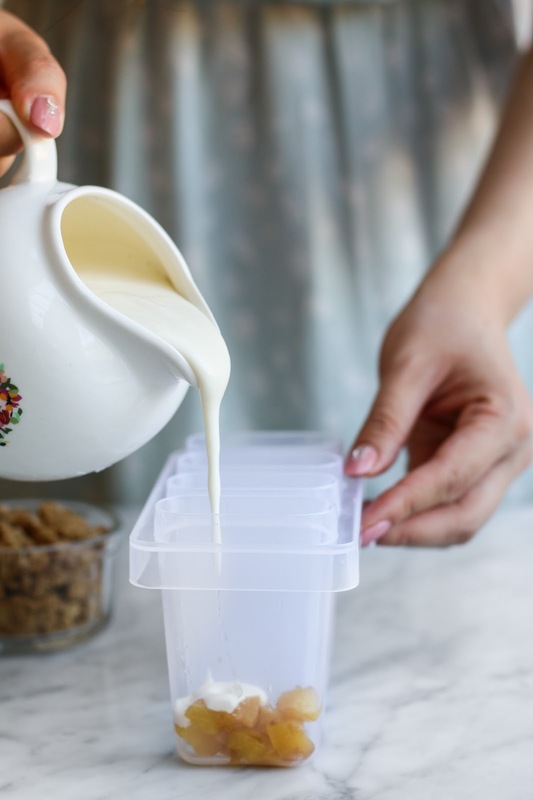 Do the same with Greek yogurt. Add vanilla. Blend until well-combined. 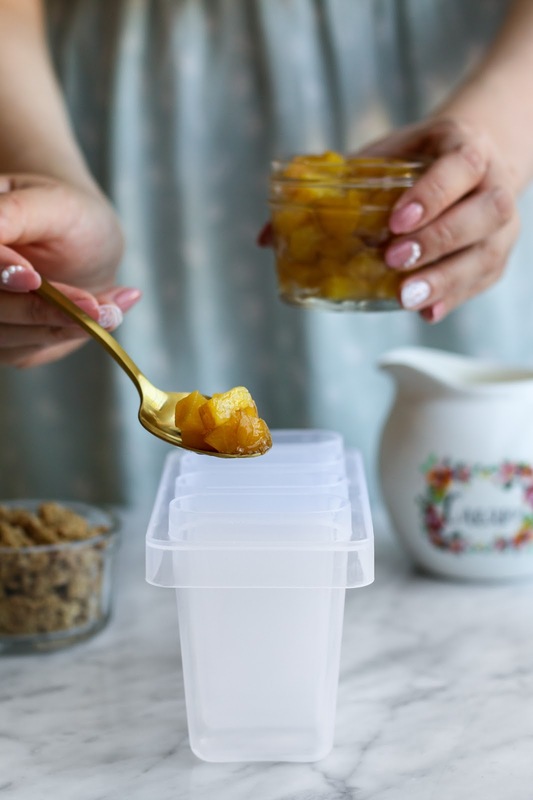 Transfer base into a measuring cup for pouring. 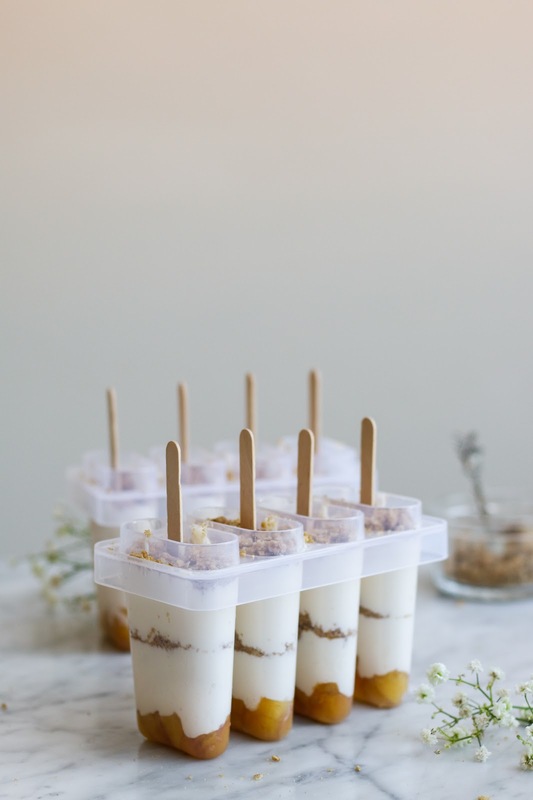 For each ice pop cavity, take ½ tablespoon of diced peaches and place it at the bottom of the ice pop mold. Pour cheesecake batter until halfway. Sprinkle on streusel. 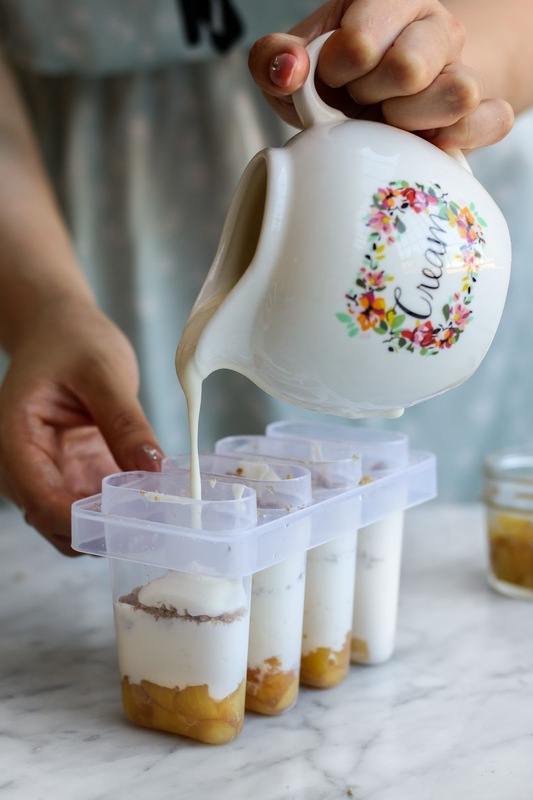 Fill in the remainder of the cavity with cheesecake batter. Finish off with some streusel. Freeze for 4 – 5 hours until ice pops are firm. To release the ice pops, run the ice pop molds under warm water for a minute. I loved this!! Wonderful read and gorgeous photos! 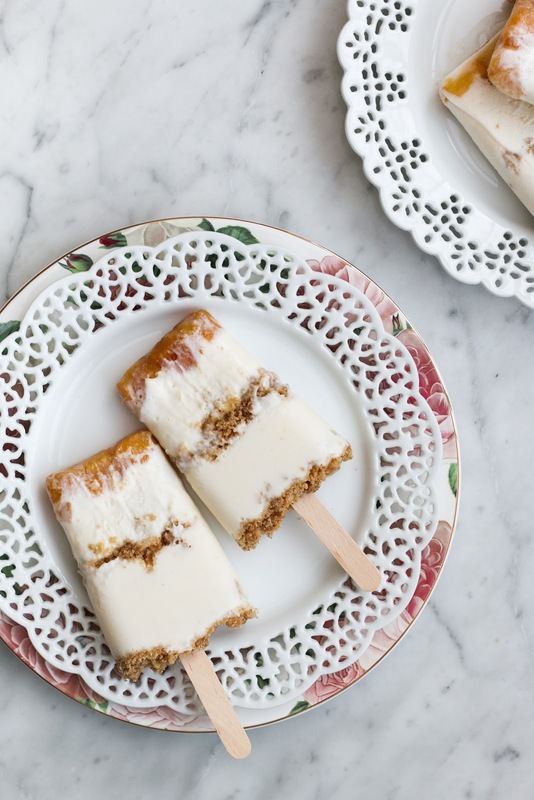 Cheesecake ice pops seem pretty awesome, tasty and mouth watering. I would love to try them out this summer. Hope I could make them as delicious as this pik.